I got a giftcard from Covered in Wrappers for my birthday to BC. I decided today was the day to get some cards. I picked up seven Topps Chrome ($2.99/pack). Just a little something to get through the day. I wasn't too thrilled with these boxes from everything I heard. I decided to go for it anyway. Technically, they were free anyway. The first pack I got a Mickey Mantle story card. Not too shabby, but it was in the second pack that I got a good card (finally!). 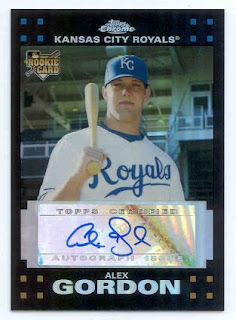 Alex Gordon autograph refractor 155/500. I also got a Mickey Mantle story card refractor. Those were the two biggies. Out of seven packs, I'm not complaining.